Despite a heavy mission workload successfully undertaken in the eastern states over the next six years [from 1877], Woods’ scientific output was prolific and his reputation as an eminent colonial scientist grew. In 1883, with offers of mission work declining, he accepted a British Government commission to examine thoroughly the geology of the Malay Peninsula. For the first time, science became his sole source of income. 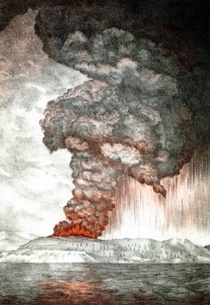 Woods spent a month in Java after the eruption of Krakatoa and saw the sea strewn with human corpses: ‘Some got foul of the screw of our steamer, and the stench was perfectly horrible.’ He reached Singapore in October 1883 and conducted his scientific investigations throughout the Malay Peninsula over the following twelve months. In Perak five elephants were placed at his disposal, as well as ponies, orderlies, and a Chinese Christian servant who served daily Mass for him. Woods travelled extensively in China and Japan before returning to Port Darwin in June 1886 after almost three years in Asia.